In 1973 Lou Reed stood at the crossroads of the career he had been working for. The previous year had seen the Bowie/Ronson co-produced Transformer scoop him from the record collections of those in the know to the pop charts. His record label, RCA, were understandably keen to receive Transformer 2. Reed, always as contrary as he can be, stood at the fork in the road. Down one was the smooth sail toward success, another hit record and widespread acclaim. Down the other road? His principles, his loyalties to himself and his own passions and the tug of the darker directions in which he knew he needed to go. He chose the latter road, delivered 1973's Berlin to a horrified RCA and set off on the career path that brings us to his current, exalted, position in rock history. Once Dylan had shown the way, that you didn't need a sweet crooners voice to get records made and sold, artists like Reed found themselves with a future they could reach. In remaining true to himself and releasing the bleak Berlin, a tale of drug addiction, suicide and depression, a theatrical almost rock opera, he destroyed his own chart-bound career singlehandedly. Produced by Bob Ezrin - best known for his heavier rock work with Alice Cooper and Kiss - it was a shock to the system and, with reviews mixed and sales sluggish, Reed and Ezrin abandoned plans for a stage interpretation of the material. It was a forgotten record. At that time, Reed hadn't even visited Berlin. As years passed the maligned album was rediscovered and anointed a misunderstood masterpiece. Indeed, one can only imagine the effect it had on Bowie at the time who, three years after the albums release, fled to Berlin to escape his own addictions and found the inspiration there in person that Reed had found in absentia. At the end of 2006, these dark, orchestral songs found their way out of the dust and into Brooklyn, Reed's birthplace. An idea to perform the entire album with the Brooklyn Youth Chorus, brass section, backing vocalists and a collection of acclaimed musicians had come to fruition. Over five nights at the tiny St Ann's Warehouse, artist turned film director Julian Schnabel filmed the performances, staged in front of his own set design. The film starts with Schnabel's brief on screen introduction, welcoming the audience and Reed's mother and sister to the show. Then the band, including original album guitarist Steve Hunter, take the stage, as the lights swirl. Hunter sports a beanie hat, Zappa-esque facial hair, glasses and a crooked toothy grin that remains on his face throughout the film. His playing, perhaps the only mainstream aspect of the performance, dazzles throughout. The songs are staggering in both their complexity and simplicity. Behind the band is a screen playing the story of the album's protagonist Caroline, played by French actress Emmanuelle Seigner; beautifully shot by directors daughter Lola. The dramatic scenes linger over the music, overseen by original album producer Ezrin and Hal Willner, wrapping around the story. But the camera lingers on Reed - as inscrutable as ever, but allowing himself a few stolen smiles. Berlin might be his masterpiece and he knows it. This film is no Shine A Light. There are no rich bankers and their young girlfriends in the audience, whooping as they hold their sponsored beer holders aloft. The deep lines on his face are all that connects him with that world. He trades guitar lines with Hunter and vocal lines with perfect guests - backing vocalists Sharon Jones and Antony Hegarty. This assault on your senses comes to an end with a searing take on Rock Minuet, from 2000's Ecstasy. Going further back than the film's subject, Velvets classic Sweet Jane plays out over the credits. This film is masterful; it puts you not only in Brooklyn on those December nights but also sends you to 1973 - where a future of certainty was rejected for something from the dark heart. 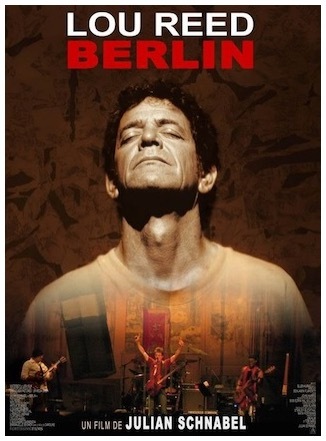 Berlin, opens July 25 2008.